Somtimes verbal agreements can be distorted. FixOn.Me! allows you to fix any agreement or bet with anybody quick and easy. If distortion occurred just come back to site and compare real situation with fixed agreement. Use FixOn.Me! instead of saving some agreements in history of Skype or ICQ. At first, you and your friends/colleagues/partners create some verbal agreement or bet. One of participants (may be you? 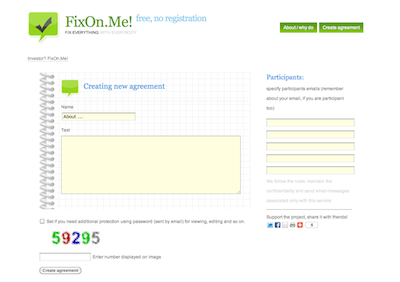 ), visit FixOn.Me, write text of agreement and indicates participant’s emails. Each sent email has a text of agreement, direct links to it and personal unique code to fix an agreement. All participants are reading agreement and fix it using direct link or personal codes. If agreement is changed by any participant, new emails are sent to all with new personal codes. Agreement is finally fixed and disabled to editing, when all of participants are agreed with text. Save link to agreement. Ready!